Cooler Master's MasterBox Q500L is a well-designed case, both when it comes to usability and manufacturability. Rarely have seen a case offers such a low price, such a compact ATX form factor and such few limitations. The Q500L is what puts the word Master in MasterBox. For £50, Cooler Master is offering us a lot of case for our money, and while some may moan that the enclosure lacks tempered glass and other "premium" features, it must be remembered that hitting such a low pricing target inevitably comes at a cost. That said, given this enclosure's suitability as a LAN-ready chassis, we can see some positives to avoiding tempered glass, as that material isn't exactly transport-friendly. So how did Cooler Master hit their £50 price point? That's simple, economies of scale and minimising the number of processes that are required to build each enclosure. Fans of the Q300L will know that the Q500L features many of the same design elements, and eagle-eyed readers will have already noticed that the Q500L features the same panel design at the top, front and base of the enclosure. These design elements enable Cooler Master to create their Q500L with heightened efficiency, while also allowing the case to be inverted and otherwise modified with ease. Not many cases of this size can accommodate a full ATX system, but the Q500L takes this in its stride, comfortably fitting a full ATX mainboard inside alongside some reasonably long graphics cards. Yes, your PSU mounting position may limit the length of your graphics card, but some careful component selection will ensure that almost any modern graphics card can fit inside the Q500L. Yes, this case has some flaws, what £50 case doesn't. You could argue that the perforated front/top panels are not designed for optimal airflow, but to counter that we could say that the design enables better, more varied, mounting options for both fans and water cooling radiators. 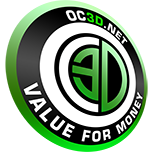 Beyond that, the simple design of these panels also offers the modding community with plenty of options when it comes to custom upgrades. When it comes to storage, some users will find the dual 2x 2.5-inch/1x 3.5-inch drive bays to be inadequate, but those users should already be avoiding small form factor cases. Limited space for storage is a big concern for small form factor systems. That said, two 2.5-inch SSDs and a single HDD should be more than enough for most users, especially as M.2 SSDs increase in popularity. What impresses us most about the Q500L is the sheer number of options that the case offers despite its form factor, such as the ability to fit 240mm water cooling radiators into the chassis at both the top and bottom of the enclosure. Not bad for a compact ATX case. If you wanted to, users of this case could even fit ultra powerful Threadripper X399 systems into the Q500L, which is an insane feat for a £50 small form factor enclosure. We have seen MITX cases that are almost as large as the Q500L, a factor that makes its ATX support all the more astounding. Cooler Master's Q500L is a deceptive design, as we could see many PC builders dismissing this case out of hand as a "cheap" design. If you take the extra time to look into this enclosure further, you will see the many smart design decisions that enable Cooler Master to deliver so much case for so little money. Do you need to compromise your ATX system to use Cooler Master's compact Q500L case? Not really, and that's the most impressive thing about this case. Cooler Master took their MATX Q300L and managed to fit larger components into the same space without inhibiting component selection in a big way. With this in mind, it is hard to not be impressed by the Cooler Master MasterBox Q500L. It is rare for a case to wow us in such a simplistic way, and it is even rarer for a £50 chassis to leave us this impressed. 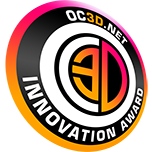 Cooler Master deserves both the OC3D Innovation Award and the OC3D Value For Money Award for their MasterBox Q500L PC case.